Lattes Montpellier required overtime to keep their EuroCup Women record intact in what turned out to be a perfect evening for clubs from the Ligue Féminine de Basketball. Basket Landes, Nantes-Rezé and Tarbes all picked up important home wins. Tarbes' victory against Russian side Spartak Noginsk (71-42) is just the team's third win in official games this season. 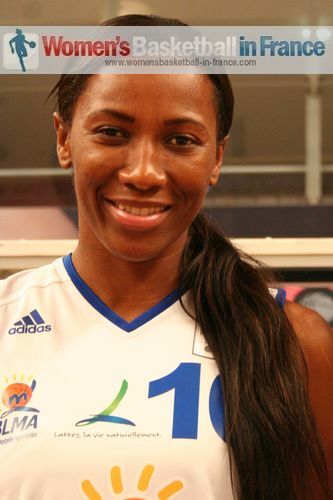 Although Tarbes officially parted ways with Lauren Ervin this week, they did not require the services of their assistant coach Lina Brazdeïkyte. A 9-0 run during the first quarter enabled Tarbes to open up a double-digit lead by the end of the first quarter (21-11). After controlling the pace of the game in the second quarter (37-24) they blew Spartak Noginsk away in the remaining quarters. Paoline Salagnac helped herself to 20 points while Joyce Cousseins-Smith finished with 13 points and 4 assists. Lattes Montpellier have an interesting problem. Kristen Mann is back in training and is expected to join the roster by the end of November. In the meanwhile Mann's replacement Géraldine Robert is in excellent form and has been the catalyst in many victories. It was Robert's (18 points and 11 rebounds) 2 free-throws in the last minute (69-69) that enabled Montpellier to force overtime against BC Chevakata. Montpellier got their act together in overtime to win their second EuroCup Women tie (87-76) with Edwige Lawson-Wade firering in 32 points and dishing out 6 assists in the victory. Basket Landes needed 10 final-quarter points from their captain Anaïs Le Gluher-Cano (27 points) as they held off Dynamo Moscow (79-73) in a see-saw battle. Nantes-Rezé once again decided to make hard work of winning a match that they controlled for most of the time. All the same they beat Dynamo-GUVD (63-58). Marielle Amant led the scoring with 14 points while Gunta Basko-Melnbarde dished out 7 assists. Elsewhere there was a little bit of EuroCup Women history in Denmark with the live transmission of the SISU game against Satu Mare from Romania. The match was rather scrappy and was won by the visitors (57-46). SISU play Lattes Montpellier in round 3. In Belgium they continue to find ways of promoting women's basketball with the encounter between Lotto Young Cats and Ted Akara being streamed live. A poor second quarter by the Young Cats allowed Ted Akara to build up a sufficient advantage which enabled them to win the game (80-69) despite the 23-point haul by Sofie Hendrickx. For Belfius Namur, another club from Belgium, it all went wrong in the last 90 seconds. Leading (66-60) after a three-ball by Audrey Salvi they allowed Shavonte Zellous and Bahar Öztürk from Mersin to run riot and win the the game (70-66). On the second day of EuroCup Women action Hainaut Basket completed a perfect week for French clubs with a hard fought victory against Olimpia Grodno (65-60). 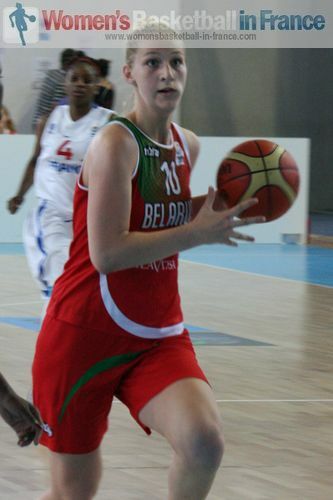 However it was 18-year old Maryia Papova (in picture) from Olimpia that stole the show with 23 points. Kayseri Kaski Spor showed no mercy against Telge Basket with a comfortable victory (81-51). The contest was more or less over after 10 minutes with Kayseri leading (32-13). The other Turkish club in action Adana Botas made hard work of seeing off Bulgarian club side Dunav 8806 (84-80). TSV Wasserburg completed the misery for Belguim clubs by seeing off BBC Sint-Katelijne-Waver (88-77). Katharina Fikiel who played for Toulouse during the 2009-2010 season fired in a game high 26 points. Fikiel said after the match "I'm happy that we won, it's important to qualify for the next round. [I'm] just happy."